I'm not known for having the best luck in the world. On the contrary, I am known for being fairly unlucky in life. I once dropped my phone down the toilet, just an example. I'm also not known for my elegance and grace. I have been known to walk into lamp posts. My luck levels were still low when I left work last week. Let me set the scene for you; 18:30, rush hour in London, there is a nip in the air and the sun has been gone since lunchtime. Many a people are rushing in their winter coats and rucksacks, overtaking fellow pedestrians as if it is a race to see who can get to the tube first. That particular evening, I was one such person. As I was weaving in and out of the crowd, I checked to see if I had any texts on my phone, which I did, and thought to myself I'll read these as soon as I get on the bus. As I was thinking this thought, I was not aware of my surroundings, or aware that I was in fact walking quite speedily towards a knee high concrete wall. Yes, ladies and gentlemen, I bumped into and fell over this wall. When I rolled onto my back and stared at my feet hanging over the other side of the wall, I thought Oh my god. You absolute fool. As I slowly began to get to my feet a man came over to me enquiring after my health. To which I replied quite dizzily, 'Errrr yeah I'm fine.' He then followed this up with another question, 'Did...' (he paused) '... did you just fall over that wall?' I must admit the dear fellow seemed as confused as I. There was no way to answer that question other then, 'Yes. I did.' I then urged him onward with his journey insisting that I was fine. I then noticed that on top of bruising my knees and spraining my wrist, I had smashed my phone screen and my glasses had taken quite a hit too. Eventually as I got to my feet filled with mortification and irritation, I continued to the bus stop, I couldn't help thinking, This is going to be funny in a couple of hours as I shed a quiet tear. This was out of pure shock and embarrassment. Even though this whole incident cost me (literally and also physically) in damages, I do now find it all rather funny. I also now realise that it could be written into an episode of Miranda. All I want to know, is this: why was there a knee high concrete wall in the middle of the pavement?!!! 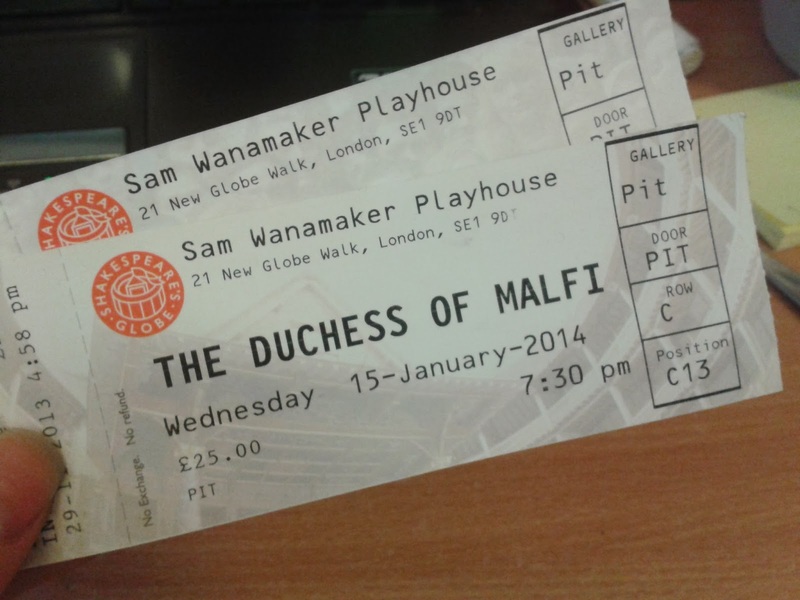 One of the best presents I was given last Christmas was tickets to the new Sam Wanamaker Playhouse (next to Shakespeare's Globe) which opened on January 9th 2014, to see the theatre's first ever production, The Duchess Of Malfi, by John Webster, directed by Dominic Dromgoole. 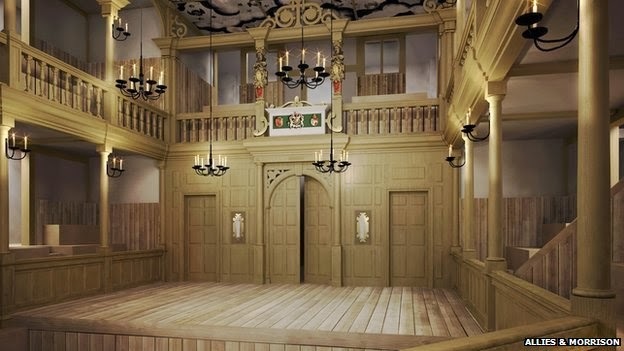 The Sam Wanamaker Playhouse was built to resemble the first ever indoor theatres of the Jacobean era and the building plans were based on an original drawing of the time by Inigo Jones. As soon as my good friend Lauren and I walked into the theatre you could smell the newness of the wood and the atmosphere was set with periodic music played with lutes and violins on the balcony above the stage. The music that accompanied the play was played live by a quartet of musicians in period dress and the whole production was lit by candlelight as it would have been when The Duchess Of Malfi was first staged. The fact that the actors were essentially their own lighting technicians also enabled them to use the light to their advantage by placing the candle in a specific place to highlight their face for a particular moment, whether is was to accentuate the fear they felt of the evil they were projecting. It has to be said that the ensemble of actors chosen for the roles were all remarkable and were so captivating throughout the entirety of the play. A special mention must go to Gemma Arterton, (who's credits include Quantom of Solace, St. Trinians and Prince Of Persia) who played the lead role of the Duchess of Malfi. Arterton portrayed the Duchess with a lot grace, which was later then converted into great strength that fuelled her resistance against her villainous brothers, Ferdinand (David Dawson) and the Cardinal (James Garnon). David Dawson, for me, was the most captivating actor on stage by far. In Act 1, he intrigues the audience by exposing a little light comedy within the character of Ferdinand so that when he vows to torment his sister, and the reality of his character is exposed, the audience becomes a lot more shocked by his actions. Especially through his decent into madness, Dawson used his incredible talent to make the audience feel uncomfortable and disturbed by the crazed Duke before them. I would give anything to even have a shred of talent that David Dawson has. I give it a 5 apple rating! The Duchess Of Malfi will run until February 16th 2014. For more information or to book tickets go to the Shakespeare's Globe website.